The SATELLITE show team typically spends the first half of each summer getting as much of the busywork done so that we can spend as much of the second half of each summer as we can reading the hundreds of proposals that come in for SATELLITE speaking opportunities. Throughout the process of conquering my summer SATELLITE reading, I noticed that a majority of the topic proposals seemed strangely familiar to me, to the extent that I was getting a strange sense of nostalgia for my early career as a journalist in Philadelphia. 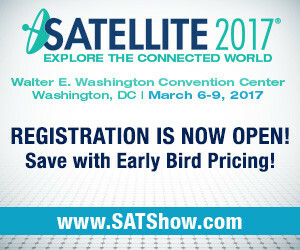 Have you secured your seat at SATELLITE 2017? Early Bird pricing on the Conference and free passes to the Exhibition end after December 8! Register today! SATELLITE 2017 will feature a brand-new keynote speaker series - the Innovation Forum - composed of 30-minute presentations delivered by the top leaders and innovators of our industry, as well as some of the most prominent end-users and customers we serve. The following are just a handful of the keynote presenters we’ve confirmed early on and we’ll be announcing more in the months to come. Secure your seat today for SATELLITE 2017 to ensure you're a part of the conversation! NASA Goddard Space Flight Center Deputy Program Manager Benjamin Reed will present a keynote directed to satellite manufacturers and operators titled “Should You Make Your Satellite Serviceable?” which will outline what steps owners and operators can take to prepare their fleets for servicing calls and ensure that the industry is fully prepared to reap the benefits of a servicing-enabled paradigm. From C-level executives representing the largest aerospace companies in the world to engineering students with fresh, exciting ideas to share, the SATELLITE show floor will be jam-packed with the latest technologies and brightest minds shaping the future of the world’s space economy. You won’t want to miss the opportunity to have your company’s cutting-edge solutions on display at the largest annual gathering of its kind, in a venue packed with current customers, new business prospects, integrators and potential strategic partners. October 3, 2016 - TAUNTON, Mass. – General Dynamics Mission Systems announced today that new and improved versions of two key Warfighter Information Network-Tactical (WIN-T) Increment 2 capabilities have begun the test and evaluation process at U.S. Army installations across the country. Integrated on HMMWVs instead of five-ton FMTVs, both the Tactical Communications Node-Lite (TCN-L) and the Network Operations and Security Center-Lite (NOSC-L) feature a greatly reduced footprint and improved transportability for expeditionary operations (C-130 roll-on/roll off and CH-47 sling loadable). The TCN-L and NOSC-L provide the same networking and network management capability to command posts while reducing the complexity to install, operate and maintain the Army’s mobile tactical communications network. [Via Satellite 10-03-2016] Advantech Wireless has received a significant follow-on order for military-grade satellite modems from an undisclosed customer. [Via Satellite 09-30-2016] Orbital Insight, a U.S.-based geospatial analytics and software company, has announced the general availability of China Oil, the latest addition to its global oil supply monitoring tools. [Via Satellite 09-29-2016] NovelSat has launched a new satellite Network Management System (NMS) called NovelNet NMS, designed to accelerate the deployment of both point-to-point and point-to-multipoint links. [Via Satellite 09-28-2016] S7 Group, the largest private aviation holding company in Russia, has agreed to purchase Sea Launch, operator of the Zenit launch system. ​[Via Satellite 09-27-2016] Rocket Lab has announced the completion of its first orbital launch complex, Launch Complex 1. Located on New Zealand’s Mahia Peninsula, Launch Complex 1 is designed to enable a high frequency of space.